In the past, we've said that Batman's best villains reflect him in some way. But think about what a reflection is: in many ways it's just like you, but it's also your complete opposite. Batman is dark and orderly? Joker is bright and chaotic. Batman believes in the justice system? Two-Face abandoned it in favor of pure random luck. Batman is the world's greatest detective? Riddler is the world's greatest mystery. With an obsessive-compulsive need for attention, Edward Nigma is determined to be the cleverest of Gotham City's criminals, plotting elaborate trails of clues and riddles around his crimes. Batman has proven a worthy opponent, capable of unraveling the Riddler's most intricate plans, but Nigma is dedicated to creating a mystery that will stump the Dark Knight, even if he has to kill someone to do it. Humiliated by Batman on Arkham Island, Nigma is more determined than ever to bring the Caped Crusader to his knees. It's great to watch Riddler become more frustrated as the Arkham series progresses. In Origins, he was just interested in blackmailing people; Batman stopped him, so in Asylum was trying to prove he was smarter; that didn't work, so in City he was trying to kill Batman under the guise of puzzles; finally, in Knight, he just said "eff it," bought up a bunch of decommissioned sewer lines under the city, and made Batman race his car through them. If there's ever another game, Riddler's just going to be standing at the end of a hallway firing a gun, trying to "riddle" Batman with bullets. Since this figure is based on Arkham City, he's only partially unhinged. His face is skinny, and is sculpted with the same kind of two-expression face that animated Riddler sported - in this case, it's even more extreme, with a big happy grin on the left side, and an unhappy grimmace on the other. It looks a bit weird head-on, but makes him look completely different depending on which way you have him facing in your display. Riddler's clothes deteriorate as much as his plans do: he originally wore a dress shirt and a sweater vest, and ultimately a plain green shirt over a ripped and grimey tank top. 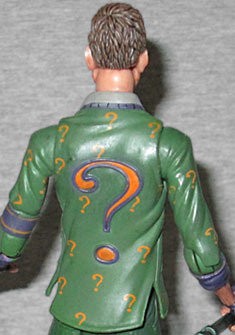 This one, falling halfway between the two, is in a green suit with purple lining and yellow question marks all over the jacket. Showing his increasing frustration, his tie is loosened and his sleeves are rolled up. He's wearing purple fingerless gloves with a question mark on the palm, and there's a purple band around his left bicep with another. The theme carries over to his tie tack, as well as the large question mark on his back - that's a raised element, not just paint. He's also sculpted with pockets and buttons, and is generally as good as all DC Direct's other Arkham City figures. The same goes for the articulation. 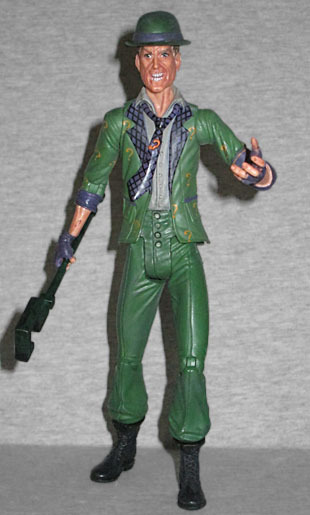 Riddler has a balljointed head, swivel/hinge shoulders and elbows, swivel wrists, T-crotch, hinged knees, and swivel ankles. So, not a great amount of movement, but not completely awful, either. One of the wrists was stuck so tightly that it actually broke off, but it's not like there was a ton of range there anyway. I just picked an angle I liked and glued it back on. It seems to have been a common problem with this series. 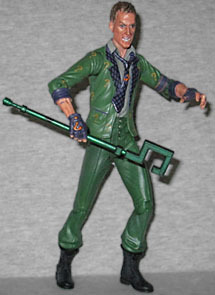 Riddler only has two accessories: his bowler hat, which doesn't want to stay on his head very well, and his square cane. Really, guys? That's all he gets? You couldn't have thrown in one of the Riddler Trophies that we spend half the game hunting? Just a neon question mark on a base, how hard is that? And why on Earth doesn't he have his glasses? He looks weird without them. Some people didn't like that Arkham City made Riddler into a low-rent Jigsaw, putting people into complicated deathtraps. But really, the thievery goes the other direction: before the 1966 TV show made it a trait of all the Bat-villains (because it was an easy way to induce a cliffhanger), creating traps was Riddler's bread and butter. He'd lay out some clues, lure someone to their death, and Batman would have to save them; Arkham City just took him back to his roots.